Trained in the use of firearms and licensed to carry a weapon, MSS armed guards can be engaged to protect people, but more often they are tasked with the protection of items of substantial value. These items may include cash, jewelry, fine art or even rare documents. MSS can also provide armed security for establishments like pharmacies as well as a host of other entities across the entire Gulf South Region. Though unarmed, each guard is extremely well trained and fully capable of providing protection across a wide range of situations. These include, but are not limited to, retail environments such as supermarkets and shopping malls as well as educational campuses (universities and high schools). MSS can also provide unarmed guards to serve as escorts, when needed. Commonly viewed as simple desk attendants or receptionists, MSS concierge officers offer a host of security services for organizations that want to maintain a professional yet secure environment. Currently serving many of the area’s luxury residential properties, a simple uniform change allows our officers to serve in corporate environments as well. These officers are recruited for their exceptional customer service skills and are rigorously trained to provide premium security functions that protect all assets within the organizations they serve. 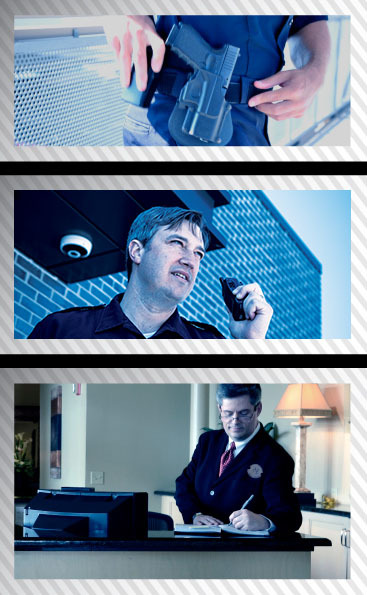 Specializing in loss prevention, Merchants' undercover security officers can help to improve the safety of your company as well as improve its bottom line. Because loss prevention is so easily measurable, companies can track the effectiveness of these officers' efforts. MSS agents can blend in with shoppers to help identify shoplifters, problem employees or other security issues. In addition to serving retail outlets, plainclothes officers can help to uncover employee theft in store warehouses.